It is fairly common knowledge that once someone gets into their 60s, the cost of purchasing life insurance can become much higher - especially as compared to those who are in their 30s and 40. One reason for this is because life insurance companies’ price their coverage based in large part on life expectancy factors - and, as one's age goes up, their life expectancy tends to decrease. Another reason for the higher cost of coverage is due in large part to the fact that older individuals are typically more prone to adverse health conditions - and, because of that, some of these issues could lead to an earlier death. Here again, the insurer may see someone who is in their 60s as being a potentially higher risk of claim. But today, unlike even just a few short decades ago, medical technology has helped our life expectancy numbers to increase a great deal. And, given that people are living so much longer now, this can be good news for both consumers and life insurance carriers, as it has lowered the risk of insurers, and decreased the cost of life insurance coverage for those who may still need it. Why People in Their 60s Still Need Life Insurance? Contrary to what some people may believe, there are numerous reasons why people who are in their 60s may still need life insurance protection. While most of these individuals may not still have small children on whose income they rely, they can still have a number of other financial obligations - and, if the unexpected were to occur, it could present a major hardship to their loved ones and other survivors. For example, while many of those who were in their 60s years ago may have had their large debts all paid off, things are quite different today. Nowadays, someone who is 60 or over may have many years left to pay on a mortgage balance, as well as auto loans, credit card debt, and other types of loans. Leaving loved ones with this type of debt to pay off could throw them into financial devastation. In addition, upon passing, many types of pensions and other retirement income sources can either become reduced or may even end completely. This could leave a descendent's spouse without any means of support. Having the proceeds of a life insurance policy, however, could be a way to ensure that your spouse or significant other will still have a means of support - especially if they are unable to go back out into the workforce. On top of any and all of one's other obligations, most people - regardless of how old or how young - will have at least some type of final expenses at their time of passing. Today, on average, a funeral and related costs can run roughly $10,000 when factoring in the memorial service, flowers, transportation, headstone, and burial plot. Because most families just simply do not have this amount of money readily available for such expenses, a burial life insurance policy can provide an ideal way to quickly pay them off, without having to dip into savings or other assets, or worse yet, put these costs on credit. There are many different types of life insurance that are available to those who are in their 60s - and the one that is right for each individual will depend upon his or her specific situation and needs. Today, there are two primary forms of life insurance that are sold in the market. These include term and permanent coverage. With term life insurance, the insured is covered with death benefit protection only, and there is no other cash or investment component that is included. The "term" of coverage can be chosen for a certain number of years, such as one year - which is typically renewable each year. There is also usually an option for 5, 10, 15, 20, and 30 years as well, depending on the actual age and health condition of the individual at the time of application. When a person is covered with term life insurance, it is important to be aware that once the policy's term expires, the insured will need to re-qualify for coverage again if he or she wishes to continue being insured. Therefore, term life insurance is usually a good option for covering needs that are considered to be more "temporary" in nature such as the remaining balance of a mortgage. For those who are seeking more life-long coverage, permanent life insurance may be a better fit. Permanent coverage will remain in force for the remainder of a person's life, provided that the premium continues to be paid. This can be a good type of insurance for people in their 60s because once qualified; the coverage cannot be canceled by the insurance carrier unless the premium stops being paid. In addition, the amount of the premium that is charged by the insurer is typically locked in and guaranteed not to increase - regardless of the increasing age of the insured, and whether he or she contracts an adverse health condition. A permanent life insurance policy can also offer other benefits to someone who is in their 60s as well. This is through its cash value component. This area of the policy allows the tax deferred buildup of funds within the policy - meaning that no taxes are due unless or until the cash is withdrawn. The cash may be either withdrawn or borrowed for any reason. For a policyholder in their 60s, this can provide numerous advantages, such as the payoff of a mortgage, reduction or pay down of other high-interest debts, or even the supplementing of retirement income. Also, because there is generally no contribution limit like there is with tax-qualified 401(k) and other retirement plans, a permanent life insurance policy may also offer someone in their 60s a great way to deposit and accrue additional tax-deferred savings prior to retirement. The cost of life insurance for people in their 60s can vary based upon several factors. These can include the amount and type of coverage that is purchased, as well as the actual age and health condition of the insured. When shopping for life insurance for seniors, it is important to keep in mind that not all insurers will underwrite their applicants for coverage in exactly the same manner. That means that one insurance carrier may deem an applicant as a Standard, or average, policyholder based on their age and health, while another may consider the very same person to be Preferred - meaning that they will pay less for their policy. Given that, it is important to shop around with more than just one carrier before you make your final determination on which policy you will purchase. In doing so, it is much easier and quicker to work with either a company or an agency that has access to multiple insurers than it is to go from one individual insurer to another. This way, you will oftentimes be able to directly compare policies, benefits, and premium quotes all in one convenient place - and from there, you can make your decision as to which one will be the best for you. If you're in your 60s, and you are ready to start looking for the life insurance policy that will best fit your specific needs, we can help. We work with many of the top life insurance carriers in the industry today, and we can assist you in obtaining all of the important information that you will need for making an informed purchase decision. We can provide you all of the details that you need online, so you don't have to meet in person with a life insurance agent. When you are ready to move forward, just simply use the form on this page. Should you feel that you require any additional information or have any questions at all regarding finding life insurance for people in their 60s - or even if you just would like information on life insurance in general - we have experts who are standing by to take your call, so please feel free to contact us directly. We can be reached via phone, toll-free, by dialing 877-235-9299. 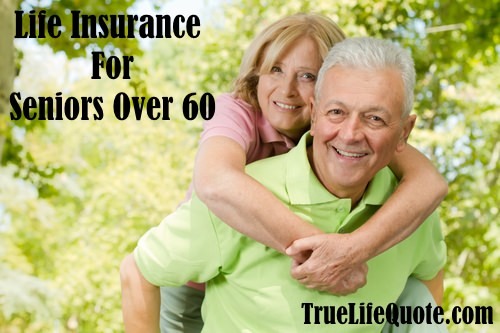 We understand that purchasing life insurance in your 60s can be an important decision. There are a lot of variables to consider - including the type of coverage and amount of protection, as well as age and health issues to contend with. But, the good news is that we can walk you through all of these essential details, saving you countless hours throughout the application process, and getting you closer to the peace of mind that you and your loved ones are seeking. So, contact us today - we're here to help.